Timothy Francis Robbins (born October 16, 1958) is an American actor, screenwriter, director, producer, activist and amateur musician. He has won many awards in his career, including the Academy Award in 2004 for his work in Mystic River. He was born in West Covina, Los Angeles County and raised in New York City. He was the partner of actress Susan Sarandon from 1988-2009. 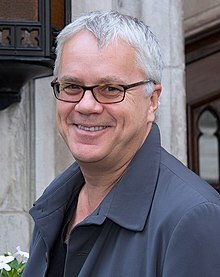 ↑ Happy Birthday to Pound Ridge’s Tim Robbins | The Pound Ridge Daily Voice Retrieved 2014-10-01. This page was last changed on 23 April 2015, at 02:39.